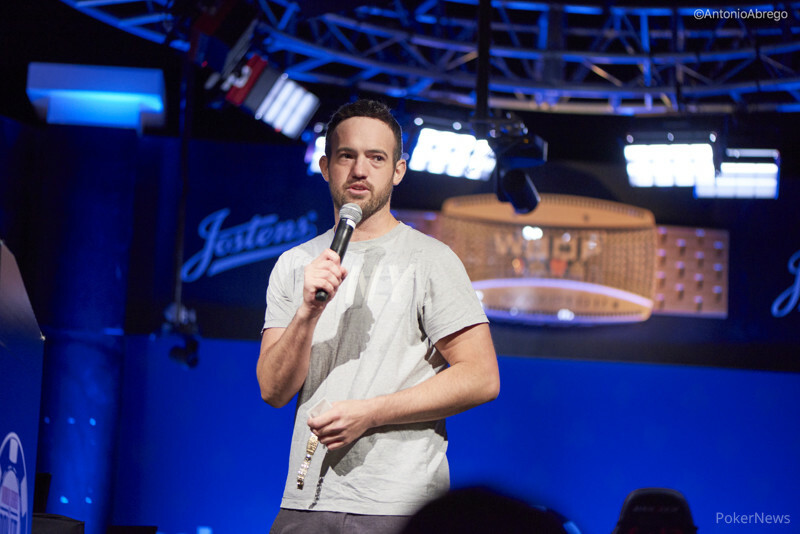 After 196 hands on the final table, Joe Cada won the 2018 WSOP $3,000 No-Limit Hold’Em SHOOTOUT for $226,218, after conquering two other tables on the first two days of the tournament. 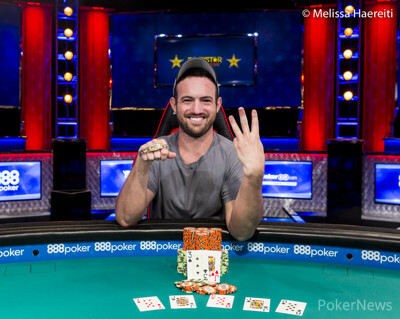 The gold WSOP bracelet that comes with this win is the third one for Cada, who also became the youngest-ever WSOP Main Event winner in history back in 2009. In total there were 363 entries this year, narrowly missing out on breaking last year’s numbers. 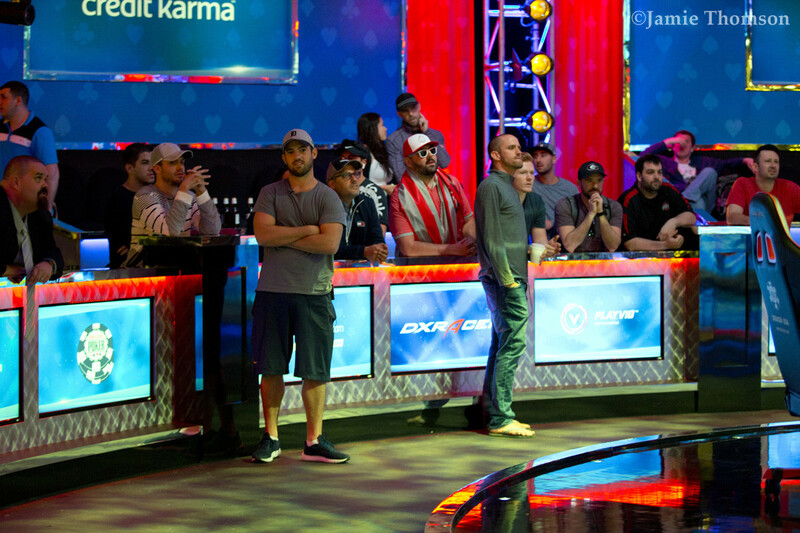 Many other well-known players were in attendance and the final table was a great reflection of the quality of the field. Joe McKeehen, another Main Event winner, Sam Phillips, Anthony Reategui, Ihar Soika, Harry Lodge, and Joshua Turner. The day started with Reategui really putting the pressure on the rest of the table, but the first elimination could be credited to Joe McKeehen when Jeffrey Trudeau ran his flopped ace-queen two pair into the turned nut-flush of McKeehen. 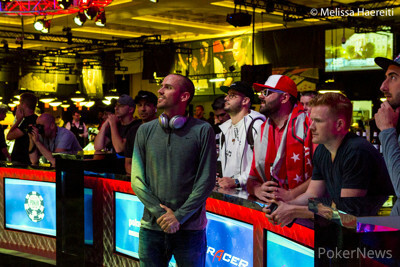 Phillips took the honors of taking out Joshua Turner in ninth place when he flopped top pair with king-queen on the deuce-nine-queen flop. 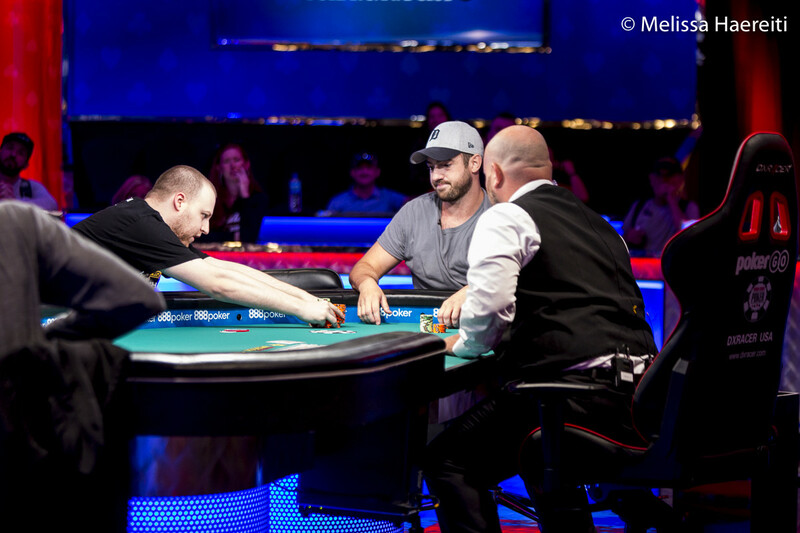 Turner had a flush draw with nine-eight suited but it never materialized and he hit the rail. Taylor Wilson first doubled up against Jack Maskill with pocket kings and then gave it all back when Maskill woke up with pocket kings. Just after the break, Wilson found kings again, shoved and got called by Anthony Reategui with pocket sixes. The board ran out to give Reategui a straight on the river, taking Wilson out of the running. An increasingly active Reategui started playing more hands but found his Waterloo against McKeehen when they both turned a flush, but the latter had the higher card to take Reategui out. This seemed to be the signal for McKeehen to start taking over all the action. His next victim was Ihar Soika who ran his king-nine into the ace-queen of McKeehen. 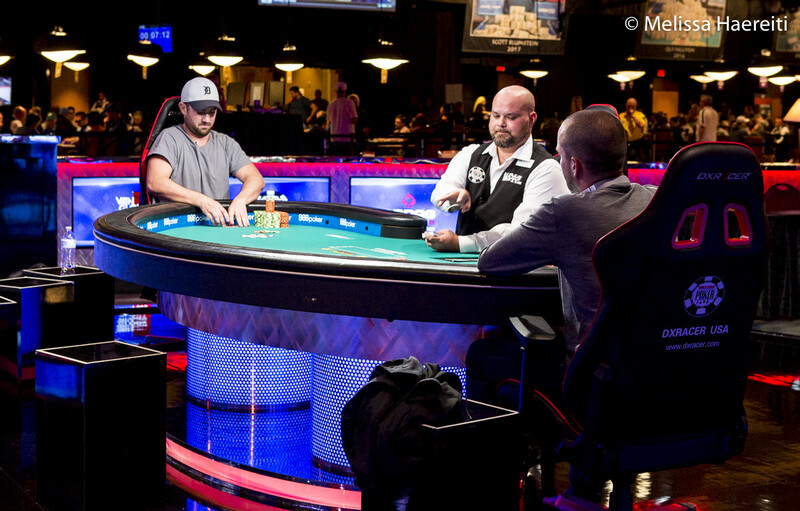 Soika hit a pair on the flop but McKeehen hit a higher pair on the turn. The UK's Harry Lodge was knocked out next. Lodge held ace-king and ran those cards into the pocket tens of McKeehen. The flush and straight draw Lodge picked up on the flop didn’t come and he was sent packing in fifth place. The last Brit at the table, Jack Maskill, was next to go when he called the all-in of Cada on a queen-nine-ace-king-ten board. Maskill held queen-ten for two pair but Cada had the better hand with pocket jacks which gave him a straight. Cada then doubled up against Phillips with pocket fives, leaving Phillips short. Right after that, Phillips tripled up and then Cada doubled him up again. In the battles of the Joe’s, McKeehen was the one to fall, four-bet shoving his pocket sixes into the pocket kings of Cada. Cada flopped a king and McKeehen turned a six but the river was a blank so the 2015 Main Event Champions was eliminated in third place. During the first hand of heads-up, Phillips doubled up with king-deuce against the ace-jack of Cada. They both flopped a pair but Cada had the higher one. The turn turned it all around as the king gave Phillips two pair for the double-up. During the eighteenth hand of heads-up play, Phillips doubled up again with ace-four against the queen-nine of Cada, gaining confidence and taking over the action. By the twenty-second hands of heads-up, their stacks were pretty even again. Phillips three-bet-shoved on Cada and Cada called with pocket sixes. Phillips held ace-four and couldn’t improve. Phillips was left less than 2 big blinds and in the hand right after, he shoved eight-six into the jack-trey of Cada. They both flopped a pair with Cada having the higher pair. The turn brought another jack for Cada to give him trips and Phillips was drawing dead. That concludes the SHOOTOUT, but the final table of Event #4: $1,500 Omaha Hi-Lo 8 or Better is still going on, Day 2 of Event #5: $100,000 No-Limit Hold’em High Roller is full of action too, and then there is also the Colossus and the Mixed Triple Draw Lowball. So whatever you need, the PokerNews live reporting team has something for every poker fan to enjoy. Hand #195: Joe Cada raised to 180,000 and Sam Phillips shoved. Cada called. Their stacks were pretty even at this moment. The board ran out - Cada's pocket sixes held and improved to two pair in the end. After counting the stacks, it was determined that Cada had 2,610,000 in front of him. Phillips had 2,750,000 in total. so after paying Cada, Phillips had 140,000 left. Hand #196: Phillips shoved all in for 130,000 and Cada called. The board ran out - the flop gave them both a pair but the jack on the turn was the final blow for Phillips as he was now drawing dead. The rail all cheered. Cada and Phillips shook hands, and Phillips made his way to the cashier for finishing in second place. 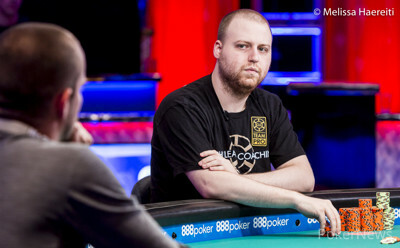 Hand #192: Sam Phillips raised to 185,000 from the but and Joe Cada made the call. The flop came and both players checked. The turn came the and both players checked again. The river came the and action checked to Phillips who then bet 275,000. Cada folded and Phillips won the hand. Hand #193: Cada opened to 180,000 from the button and Phillips made the call. The flop came and Phillips checked to Cada who then bet 130,000. Phillips made the call and the turn came the . Both players checked and the river came the . Both players checked again and Phillips then tabled for a pair of eights. Cada mucked and Phillips won the hand. Hand #194: Phillips called the small blind and Cada checked the big blind. The flop came and Cada check-called a bet of 80,000 from Phillips. The turn came the and Cada check-called a bet of 225,000 from Phillips. The river fell the and action was checked to Phillips who then bet 550,000. Cada thought for several minutes before making the fold. Hand 187: Joe Cada called on the button. Sam Phillips raised to 250,000 and Cada called. The flop came , Phillips bet 175,000 and Cada shoved. Phillips folded. Hand #188: Phillips shoved and Cada folded. Hand #189: Cada raised to 175,000 and Phillips folded. Hand #190: Phillips called on the button. Cada shoved and Phillips folded. Hand #191: Cada shoved and Phillips called. The board ran out to give Phillips two pair, fives and fours, to double up. Hand #178: Sam Phillips opened to 135,000 from the button and Joe Cada called from the big blind. The flop came and action checked to Phillips who bet 60,000. Cada folded. Hand #179: Cada raised 135,000 from the button and Phillips then three-bet to 315,000. Cada folded and Phillips took down the hand. Hand #180: Cada gets a walk in the big blind. Hand #182: Phillips raised135,000 from the button and Cada folded his big blind. Hand #183: Cada raised 135,000 and Phillips folded. Hand #184: Phillips raised to 135,000 from the button and Cada called. The flop came and action checked to Phillips who bet 90,000. Cada raised to 250,000 and Phillips then folded. Hand #185 Cada called the button and Phillips raised. Cada folded and Phillips took down the hand. Hand #186: Cada got a walk in the big blind. Hand #174: Sam Phillips shoved all in for 690,000 and Joe Cada called. The flop came to give them both a pair but Cada the better one with the aces. The turn brought them the to give Phillips two pair, kings and deuces. He just needed to avoid an ace or jack to double up. Phillips' rail shouted out for a four and the river delivered just that with the . And Phillips doubled up. Hand #175: Cada raised to 140,000 and Phillips called. They both checked through the on the flop to the on the turn. Phillips bet 120,000 and Cada called. The river completed the board with the on which they both checked. Phillips tabled for a pair of fours which won him the hand. Hand #176: Phillips called the button and Cada opted to check. The flop came , Cada check-raised the 60,000 bet of Phillips to 185,000. Phillips folded. Hand #177: Casa raised to 135,000 and Phillips called. The flop came , Phillips check-folded to the 140,000 bet of Cada. Hand #173: Joe McKeehen opened to 130,000 from the button and Joe Cada then three-bet to 415,000. McKeehen then moved all in and Cada quickly made the call. Players revealed their hands and McKeehen would be at risk. The flop came down and McKeehen would need runner-runner to stay alive. The on the turn gave McKeehen a little bit of life, but the on the river did not help him and Cada took down the pot. McKeehan was eliminated 3rd and took home $101,766 for his efforts.